A short history of California salmon: Glorious past. Grim present. Dark future. Now, the story I just got done working on for QUEST Radio is about the crisis of coho salmon along our coast. But that short synopsis applies as well to coho in other parts of the state and to their larger and perhaps better-known cousins, the chinook. Wherever you look in California, salmon are in serious trouble if they have not already disappeared. It’s evident that their biggest problem is having to live alongside us. Our needs and our ability to exert our will on the world around us–to dam rivers and streams, to clear forests, to replace entire ecosystems with new ones of our own making–has wrought havoc on many species. Charlotte Ambrose, the National Marine Fisheries Service biologist in charge of coordinating an upcoming recovery plan for coho along our coast, says she has this intertwined history uppermost in her mind. 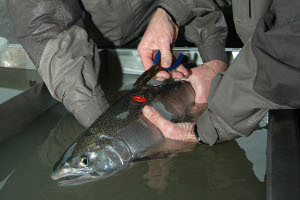 In fact, the draft of the 4-inch-thick recovery plan she’s been working on starts with a chapter on the coho’s history. Ambrose calls it “a renegade move” to open the document that way, but she says she feels it’s crucial to understand the past vitality of coho on the California coast. She’s fond of quoting a 1930s account of a coho run on Northern California’s Garcia River: “The water was like glass … the salmon were in rows … they lay there still … every now and then one would wiggle its tail to keep his place in line. They lay there by the thousands as far as my eye could see.” That’s the glorious past of the coho. But Ambrose points out that even in that lost age, coho showed a remarkable ability to handle adversity. Drought, flood, or fire might devastate a watershed and wipe out a run. But far from being “hot-house flowers,” in Ambrose’s phrase, coho are survivors by nature. They’re prolific breeders–a single female will lay 2,000 eggs or more in its streambed nest. If they find their natal streams unreachable, they’ll wander to new spawning grounds. 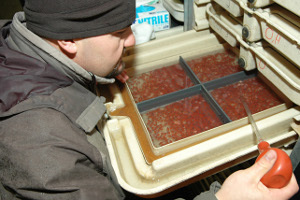 Ambrose thinks an understanding of the coho’s history–its ever-present drive to perpetuate itself, and its past abundance–are key elements to getting people to act to save the fish. And she says small steps to improve the odds of salmon survival can be as important as sweeping ones. “It’s like a small pebble in a pond. 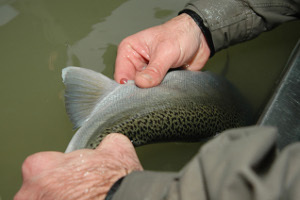 One small action can make a tremendous difference in increasing the probability of survival of the young, of the adults, of the eggs, of the out-migrating smolts.” If we want to rewrite the next chapter of the coho’s story, she suggests, get to know your watershed, and go out and volunteer to help repair it. Listen to Saving Salmon radio report online. The photographs in this article are AMAZING! My compliments to the photographer and to QUEST for including a story about the plight of the Coho and the efforts being made to return this once widespread species from the brink of extinction. Eve–thanks for the comment. Brandon Beach, the photographer, just happened to be at Warm Springs Hatchery at the same time I was. I love the pictures, too, and know he has more — hope we get to see them! Compliments on an informative piece that conveys the seriousness of the situation, and offers possible solutions. The “production values” definitely surpass kqed’s usual fare.